Vegans and vegetarians planning holidays to Byron Bay should feel good about picking this location as a destination as there are plenty of excellent Byron Bay restaurants serving up delicious food to please any palate. Whether you need breakfast, lunch or dinner, we’ve got you covered with this list of nine yummy eateries that provide everything from completely vegan, to just some vegetarian options. No matter what your dietary needs are, Byron Bay restaurants will make sure you don’t go hungry! Come here if you would like your food free from anything. This café only offers raw, vegan and organic food with selections that are gluten, dairy and sugar free. Literally everything in Naked Treaties is good for you. When you walk in, you’ll notice the huge menu of juices and smoothies but no need to worry, just ask a friendly staff member for a recommendation. Besides juices and smoothies, there are raw lunches and delicious treats. Check out their Google reviews. On Tripadvisor this vegan and vegetarian restaurant receives rave reviews, including “beautiful veggie option.” Heart and Halo, which calls itself the “good food bar,” serves buffet-style breakfast, lunch and dinner every day. One TripAdvisor reviewer said, “Oh. my. Tummy.” Not only is the food fantastic, but the price is right too (and who doesn’t appreciate good cheap eats in Byron Bay?). This is one of the most popular Byron Bay restaurants, some guests visit three or four times in one holiday! For breakfast, one can expect to feast on such items as the restaurant’s “Morriage,” a porriage made of millet with toasted Turkish bread with cheese and tomato. Lunch offers a wide range of pizzas, curries, rice and a salad bar. Location: Shop 4/14 Middleton Street. Located across from Woolworth’s Plaza on Johnson Street (just down the street from Manna Haven), Santo’s Life mainly functions as an organic food store, but it does also have a great juice bar, as well as a selection of lunch options (such as vegan or vegetarian pies, salads, pizza, salads and tarts). A good place to grab cheap eats in Byron Bay along with stocking up on yummy food to take back to your Broken Head campsite. Another food shop and café, Fundies features a juice bar along with fresh salad, vegetarian dishes, organic coffee and more. While you’re there, enjoy a cheap lunch and smoothie at the outdoor tables. It’s also great place to grab some healthy vegetarian meals to take back to your Byron Bay camping site to make at the camp kitchen or BBQ. This shop, which used to be Byron Bay’s post office, offers customers the chance to purchase organic fruit and vegetables, dried fruits and nuts and much more. If you are looking for a way to grab some organic food in Byron Bay while you’re on holiday, you can certainly hit up Fundies, the location is hard to miss on Jonson Street, right next to the Byron Bay Community Centre. With low prices and a menu that caters to both vegetarian and vegan, The Cardamom Pod hits the spot for those who abstain from meat. The menu includes salads, hot dishes, desserts and drinks. There are excellent choices for salads (like the “famous” tofu and broccoli salad with grilled sesame seeds) and main courses (such as paneer and spinach samosa). But don’t overeat because the desserts are worth the calorie expenditure with mouth-watering treats like Byron Bay bliss balls, rhubarb and strawberry tart and pumpkin cheesecake. This vegan and vegetarian Byron Bay restaurant rates as a win because it also offers cheap eats! Open: every day from 11:30 a.m to 9 p.m. Location: inside the Peir Arcade, 7 Lawson St. While it may not be a strictly vegetarian restaurant, this iconic pizza joint devotes a whole area of the menu to vegetarian – instead just offering the traditional one veggie pizza – with yummy sounding combos as garlic mushroom and spinach pumpkin. So if you’re with your meat-eating mates and need a reasonable place to fill up on dinner that will please both sides of the eating spectrum, this Byron Bay pizza restaurant might be the perfect place for you. 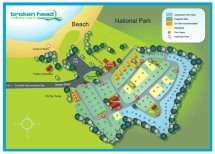 Plus, since it has the take away option, it might be great to pick up on the way back to your Byron Bay holiday park. Open: every day from 8 a.m to late. Location: 90-96 Johnson St. (near Woolworth’s, across from Quiksilver). Despite being a Mexican restaurant, Miss Margarita offers enough vegetarian meals to make the list of best vegetarian restaurants in Byron Bay. Plus, it’ll provide a Mexican fix at the same time! Holiday goers might want to take advantage of the happy hour everyday from 5 to 6 pm where you can nab a $10 margarita and other specials. If you’re wondering what offerings this Byron Bay restaurant has in the way of vegetarian, think garlic mushrooms and grilled zucchini burritos or cheese and jalapeno quesadillas. The restaurant, which opened in 2012, sits on the busy main drag of Jonson Street and even has a decked area for great people watching while you nosh on your vegetarian delights. Open: Monday to Friday from noon 3 pm and 5 pm till close, Saturday and Sunday, 11:30 am until close. Yet another option of a place where you could satisfy both vegetarian and meat eaters alike in one Byron Bay restaurant. Traditional Thai only serves dinner or takeaway, but has a menu with a good selection of vegetarian options so you won’t feel stuck. There’s even a vegan yellow curry if you have a vegan friend along on this holiday. So feel safe in coming here for a great dinner or even to pick up takeaway and have a relaxing picnic dinner at nearby Main Beach. Inspired by food vendors in Asia, Asia Joe’s caters not only to vegan food preferences but even offers gluten free options. Asia Joe’s, which is according to its website “all about fresh, healthy and colourful food,” may not be a solely vegetarian restaurant in Byron Bay, but gives its veggie customers plenty to pick from on its menu, including tofu sang choi bau, pumpkin and mushroom stir fry and Malaysian style coconut laska. Be sure to check out the Byron Bay restaurant’s full list of menus to see what’s available for the vegetarian in your life. According to the website and Facebook, Manna Haven has been closed since March for “restructure and refurbishment.” Both sites says the Byron Bay restaurant hopes to “be back in the future better than ever.” This popular vegetarian restaurant was an excellent choice for vegetarians and was quite popular. So we’ll just have to cross our fingers that the restaurant is able to reopen! Choosing to stay at Byron Bay budget accommodation like Broken Head Holiday Park while on your holiday provides you with more cash flow for things like eating out at any of the excellent vegetarian Byron Bay restaurants mentioned above. With summer on its way, it’s the perfect time of year to go on a Byron Bay holiday! Did we miss any amazing vegetarian or vegan restaurants in Byron Bay? Let us know on our Facebook page. We love hearing from you!